Everyone feels the pain of too many passwords to remember. Everyone can relate to the security exposure of weak passwords, chosen for convenience. And, everyone can relate to passwords placed in proximity to the workstation for a quick reminder. Unfortunately, that note can allow more than the intended user into the system and network. The average user today often has four or more passwords. And, security policies that focus on password complexity and password-change frequency can cause even more difficulty for users. 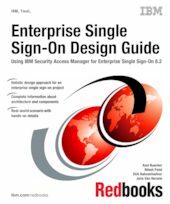 This IBM® Redbooks® publication introduces IBM Security Access Manager for Enterprise Single Sign-On 8.2, which provides single sign-on to many applications, without a lengthy and complex implementation effort. Whether you are deploying strong authentication, implementing an enterprise-wide identity management initiative, or simply focusing on the sign-on challenges of a specific group of users, this solution can deliver the efficiencies and security that come with a well-crafted and comprehensive single sign-on solution. This book is a valuable resource for security officers, administrators, and architects who want to understand and implement an identity management solution in a medium-scale environment. This book is an update to the existing SG24-7350-01.